Medical assistant Elissa Ortivez draws a vaccination at a clinic in southern Colorado, where hospitals are scarce. Americans may want to reconsider the notion that moving to the countryside makes them healthier. Rural residents have more difficulty accessing health care and are more likely to battle chronic disease than those in cities and suburbs, according to a new study by UnitedHealth Center for Health Reform & Modernization. With 16 million more Americans slated to receive coverage in 2014 through the Medicaid expansion in the health reform law, the shortage of available health care is likely to worsen. In a survey of 2,000 patients and 1,000 primary physicians nationwide, the report found that doctors in the countryside are more likely to report that diabetes, hypertension, heart problems and cancer are “major health problems” affecting their communities. They were also far more likely to view drug abuse and teen pregnancy as major concerns. When rural primary care physicians were asked how difficult it is for their patients to obtain specialty services close to home, more than 30 percent answered that it’s quite difficult. Less than 10 percent of their urban and suburban colleagues said the same. Not only do rural residents and physicians rate the quality of care in their communities lower than Americans in other locales, empirical research by UnitedHealth Group found that health care quality was “measurably worse” than in urban areas in 70 percent of markets. That’s partially due to an acute doctor shortage. 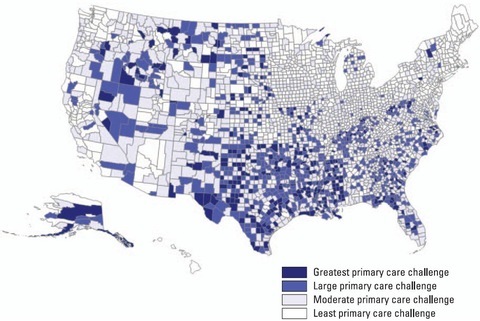 For every 100,000 rural Americans, there are just 65 primary care physicians — compared to 105 for every 100,000 city and suburb dwellers. Rural areas have half the number of surgeons and other specialists. The study synchs with one published in the Journal of the American Medical Association in early July that also found rural hospitals to be plagued by few resources and fewer specialists. According to that report, “critical access hospitals” — or those with 25 or fewer beds and located at least 35 miles from another hospital — have more difficulty caring for patients suffering from heart attacks, congestive heart failure and pneumonia. For the three health conditions, rural hospitals fared poorly on standard “processes of care” and experienced higher mortality rates. Analysis by the Lewin Group tied to the UnitedHealth study projects that about eight million uninsured rural residents will gain access to coverage they otherwise wouldn’t have by 2019 due to the health care law. Rural doctors see that as a tidal wave: Nearly half say they expect to see a shortage of physicians and mid-level health professionals in the coming years, while 37 percent of their peers in the cities and suburbs said the same. Both studies concluded that better use of electronic health records and telemedicine could help close the gap. Telemedicine holds particular promise for its ability to streamline the communication process between patients and health care providers. If used to conduct examinations and remote medical procedures, technology could help patients in sparsely populated areas share crucial information — and allow their doctors share treatment procedures — quickly and over long distances. But according to UnitedHealth, full utilization of that option would require an overhaul of rural technology and political will, including an expansion of broadband connectivity, reform of current insurance payment models, an increase in the availability of telemedicine technologies to consumers and a reduction in regulatory barriers to use of the devices.